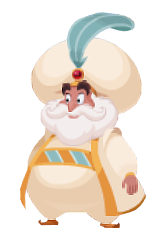 The Sultan is a character in Kingdom Hearts Union χ. He originally appeared in the animated film Aladdin and is Jasmine's father. As the ruler of Agrabah, the Sultan reigns over the city with the help of Jafar, his grand vizier. Dreaming of seeing his daughter married, the Sultan invites many princes to the palace in order to court Jasmine. This pressure pushed Jasmine to flee, which allowed her to meet Aladdin in the streets of Agrabah. One evening, after Jasmine has returned to the palace, the Sultan visits her in her room and finds her crying. Jasmine then informs him that Jafar has arrested and beheaded Aladdin. The next day, in the throne room, the Sultan reprimands Jafar for his actions and orders him not to decide the sentences of the prisoners without his consent, which Jafar approves. The Sultan then tries to reconcile his vizier and his daughter, without much success. Once the discussion is over, the Sultan wishes to discuss suitors again with Jasmine, but she leaves the room without even answering him. Always dreaming of becoming sultan, Jafar schemes to become Jasmine's husband. He uses his magic staff to hypnotize the Sultan, and convince him to have him wed Jasmine. The Sultan is saved from the grip of Jafar by strong music, and the arrival of Aladdin, disguised as "Prince Ali", who wants to have Jasmine's hand in marriage. The Sultan is overjoyed that "Prince Ali" wants to meet Jasmine, despite Jafar's attempts to convince him otherwise. When Jasmine overhears the discussion between her father, Jafar and "Prince Ali", she gets angry with them, believing they have no right to treat her as a prize. Once the princess leaves, the Sultan leaves the room with "Prince Ali", telling him that he should give Jasmine time to calm down before meeting her privately. The Sultan as shown in Kingdom Hearts II manga. The Sultan makes a cameo appearance in the manga adaptation of Kingdom Hearts II. After being released from his lamp prison, Jafar attacks the palace, forcing Jasmine and the Sultan to flee. It is not shown what happens to the Sultan. Presumably, he successfully survives and continues to rule Agrabah. The Sultan is a short, round man with a large, bushy white beard and mustache. He wears a gold-trimmed white robe over a white shirt with puffy sleeves and gold cuffs and matching white pants. Over his pants, he wears a gold and turquoise striped belt or sash. On his head he wears a massive white turban with a long turquoise feather pinned at the front with a round red jewel. His shoes are light brown and curled at the toe. The Sultan first appear in the Walt Disney's 1992 film, Aladdin. He also appeared in both of the direct-to-video film sequels and the animated television series. He was originally voiced by Douglas Seale in the original film, with Val Bettin taking over in both of the sequels and TV series. In the original film, The Sultan's role is much the same as in Kingdom Hearts Union χ, being the leader of Agrabah and father of the Princess Jasmine. He invites princes from far and wide to try for the hand of his daughter, who must be wed by her sixteenth birthday, but she refuses every suitor. Unsure of how to proceed, he turns to his vizier Jafar to find a solution. Jafar controls the Sultan with his staff, first to gain the Sultan's blue diamond ring for use in his magic, the second to attempt to make himself Jasmine's husband, and again to try to discredit Prince Ali (whom he had tried to kill earlier). After Prince Ali exposes Jafar's magic, the Sultan sends his guards to arrest the vizier, and the following day calls the people of Agrabah to the palace to announce the marriage of Jasmine to Ali. He is briefly replaced by Jafar as Sultan of Agrabah when the former gains control of the magic lamp, and is held hostage and humiliated until Aladdin defeats the vizier. With Agrabah restored, the Sultan revokes the law that the Princess must only marry a prince, allowing Jasmine to wed Aladdin. This page was last edited on 7 September 2018, at 01:15.